The Best of San Fermin! Come with us to Pamplona and Run with the Bulls! Or, maybe just watch. 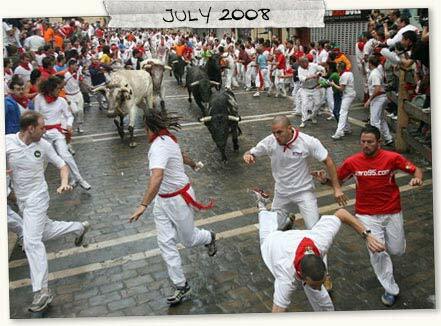 Yes, the bullrun (encierro) is extremely dangerous and, always, very unpredictable! That's probably why the San Fermín fiesta has become one of the world's most favorite destinations, each and every July! The traditions run deep, the history is fascinating, and the bullruns are WILD! COME with us to this very unusual fiesta, in honor of the patron saint of Navarra, San Fermín - clients in past years have all confirmed that they have left Pamplona with memories that will last a lifetime!! You don't know Pamplona or the Festival of San Fermín? We can help. We work with our longtime friends - residents of Pamplona - to secure the best balcony spots in the old city. We also offer apartments and rooms in the old city and excellent tickets for every evening's bullfights. Most of our balconies have a fabulous view of "La Curva", also known as the "Dead Man's Curve" - the famous corner of Mercaderes and Estafeta! Our rooms and apartments are all located within the old city so, while it may not be very quiet, you will always be in the absolute center of the old city and amidst the action for the famous festival. The bulls will nearly be at your doorstep, as our accommodations are all within the old city and just a few minutes walk to the bullrun! Bullfight tickets can be very hard to obtain in Pamplona during the festival,and buying tickets from scalpers (illegal in Pamplona) has become increasingly risky. You can make your reservations through us ahead of time. You can purchase just bullfight tickets if you wish.....we do not require you to buy an expensive "package" to arrange our services. All keys to rooms and apartments and bullfight tickets are picked up at our office on Calle Dormitalería, very conveniently located, in the center of the old city. To see a "Running of the Bulls" map, click on the map image at the bottom or this page. For information about the Running of the Bulls, the Fiesta de San Fermín, and balconies, bullfight tickets, rooms and apartments, click on this link to contact María and make your request: maria@bullbalcony.com. Please include in your request what you are looking for - balconies, lodging, bullfight tickets or all three - and include the dates you want and how many people are in your group. María will quickly contact you by phone or email and make arrangements for you to have a memorable experience at the Running of the Bulls and the incredible Fiesta de San Fermin in Pamplona! Right now, we have rooms available in the typical European "pensión" types of settings - this means that we have private rooms available, with shared bathrooms on the floors. All of our rooms are in the heart of the San Fermín fiesta, located just a few minutes walk to the bullrun route. Also, we do have apartments available for the sanfermines, 2019, depending on the size of the apartment that you may need and the dates that you will be in Pamplona - send an email to María right away, as most of our accommodations (and balconies) sell out very quickly! The alternative to not reserving a room or apartment is not a pleasant one - you will have to join the many revelers who sleep on the benches (if you are lucky enough to get a bench!) or under the trees in the Plaza de San Francisco...... If you are a rookie to the sanfermines fiesta, you will probably have dozens of questions that you are wondering about....Feel free to write to us, about anything relating to the sanfermines! We are a large extended family in Pamplona, and we have grown up with the fiesta! There is really nothing that we have not been asked about the San Fermín fiesta!! We welcome your questions and comments! We accept payment through Visa, Mastercard or PayPal. We can also accept a direct bank transfer or a personal check, if drawn on a USA bank, in the current bank rate for the euro. We look forward to hearing from you! And, we wish you "MUY FELICES FIESTAS, 2019!"